Home › Learn › Articles › What Caused the Ice Ages and Other Important Climate Changes Before the Industrial Era? Climate on Earth has changed on all time scales, including long before human activity could have played a role. Great progress has been made in understanding the causes and mechanisms of these climate changes. Changes in Earth’s radiation balance were the principal driver of past climate changes, but the causes of such changes are varied. For each case – be it the Ice Ages, the warmth at the time of the dinosaurs or the fluctuations of the past millennium – the specific causes must be established individually. In many cases, this can now be done with good confidence, and many past climate changes can be reproduced with quantitative models. FAQ 6.1, Figure 1. Schematic of the Earth’s orbital changes (Milankovitch cycles) that drive the ice age cycles. 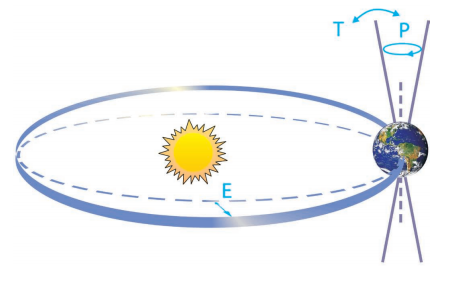 ‘T’ denotes changes in the tilt (or obliquity) of the Earth’s axis, ‘E’ denotes changes in the eccentricity of the orbit (due to variations in the minor axis of the ellipse), and ‘P’ denotes precession, that is, changes in the direction of the axis tilt at a given point of the orbit. Source: Rahmstorf and Schellnhuber (2006).